From a cynical point of view, teen dramas about cancer (i.e. Now Is Good, The Fault In Our Stars etc) are designed to exclusively cater to the heartstrings of its core teenage audience, providing for them the kind of tear-jerkers that they need to express emotions in the wake of the average action-orientated YA movie. In something of a breather, Me and Earl and the Dying Girl is far from cynical – it does its own thing with the material, while respectfully earning those tears rather than squeezing them out of us like a lemon running dry. Put simply, this is the kind of teen cancer drama that can and does please everyone. The “me” of the title is Greg (Thomas Mann), an awkward and self-deprecating high school student who aims to just breeze through the various cliques mostly unnoticed until the end of the school year. His spare time is shared with his “co-worker” Earl (Ronald Cyler II), with whom he actively makes home movies based on several film classics – giving them pun-tastic titles in the process such as A Sockwork Orange and Senior Citizen Kane – and is the closest thing Greg can consider a friend without even calling him one. Greg’s world is rocked, however, when he’s forced by his parents (Nick Offerman and Connie Britton) to spend time with Rachel (Olivia Cooke), a fellow student who has just been diagnosed with leukaemia. In any other movie, these two kindred spirits would not only make a unique bond with each other, but also become attracted to each other in a way that would ultimately lead to a doomed relationship. However, as Greg tells us via voiceover, this isn’t a love story, and the two unlikely friends thankfully never lock lips under any circumstances. 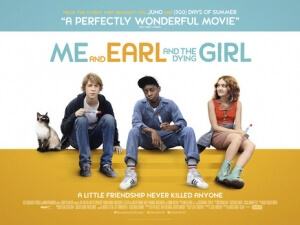 It’s one of the many ways that Me and Earl and the Dying Girl makes itself vastly different from what came before; by focusing just on their friendship, albeit a forced one, it allows both to grow out of their comfort zones and discover the things that they’ve been missing. Greg is especially due for a wake-up call like this, because his seemingly flawless plan of just breezing through high school toward an uncertain future is truly flawed as it prevents him from expanding his horizons and aiming for nothing higher than making his collection of films, which he openly admits aren’t very good either. Dropping the leukaemia element into the mix just happens to give it a more dramatic edge, and while it certainly earns our tears when it needs to it’s really the friendship between them that seems to be what this movie adores more than anything. The cast themselves are excellent, with older veterans including Jon Bernthal as a tattooed history teacher and Molly Shannon as Rachel’s emotionally driven mother standing out, but it’s the younger cast members who more than carry the film. Mann displays a certain type of disillusionment that Ferris Bueller would be proud of, but also a certain charm that livens up even his more depressing scenes; Cooke is adorable without ever becoming that dreaded “manic pixie dream girl” trope that John Green shamed extensively in Paper Towns, and she always playing things smooth and believable as anyone in her situation would try to do; and Cyler II masters the deadpan best friend routine as though it were his very own. Everyone is given considerable direction by first-time director Alfonso Gomez-Rejon, working from a vibrant script by Jesse Andrews, who adapted from his own novel. Gomez-Rejon’s style here seems to be a healthy mix of John Hughes school drama and Wes Anderson’s trademark quirkiness (various title cards tell us what parts of the story we’re about to watch), throwing in some Mean Girls-style social satire and Edgar Wright comedy timing for good measure. Camera angles zoom through hallways, up close on character’s shfting eyes, and sometimes even on its side as characters walk on a pavement; this sort of style is indie gold, and it’s no wonder this won several pundits and audience appraisal at Sundance earlier this year. It’s a fun style to watch, and Gomez-Rejon knows it as he always seems to be having fun playing around with certain shots, particular in a short sequence where Greg and Earl somehow get stoned after sampling some of Bernthal’s noodle soup (the twist ending to which is executed with absolute hilarity). But when the film comes to the heavier moments, it knows when to dial things way back down to the acceptable level. As Rachel’s cancer gets progressively worse, the sentimentality threatens to break loose. However, it’s handled in such a way that it never feels manipulative, and like Inside Out those tears are earned rather than squeezed. The final few scenes in particular are ripe with emotion, and the mixture of the acting and direction give it the oomph it needs to truly deliver. It’s clear that Me and Earl and the Dying Girl is a teen cancer drama unlike any other, and we’re not being cynical in saying that it is clearly an essential in that new little sub-genre. Me and Earl and the Dying Girl succeeds in differing from other films of its type, relying heavily on its strong acting and stylish direction to give us a likable and emotional movie that earns the tears rather than forcing them out.